As we were cleaning up we came across this littel gem. A lot of research and work was done in rebuilding it. 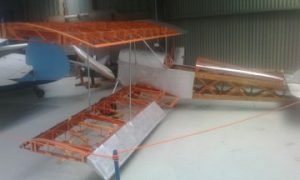 It is a home made aircraft from the 1930s. The ribs were built by making patterns from the original ribs, unfortunately decaying, and jigs were made to bend the timbers. Many hours were spent on rebuilding the right number of ribs and to the right patterns. the original spars were still good so they were kept.